The IHG moniker may not be as familiar as Hilton or Marriott, but if you’ve heard of either Holiday Inn or Crowne Plaza, then you’re better acquainted with the chain than you probably thought. The InterContinental Hotels Group – IHG for short – owns and operates roughly 4,900 properties in nearly 100 countries under the banner of at least 12 different sub-brands, including all four members of the Holiday Inn family. The chain’s loyalty program, IHG Rewards Club, is free to join and provides a host of perks to visitors – ranging from a complimentary newspaper at your door when you wake up in the morning to points for every dollar spent at IHG hotels that you can redeem for free nights. It’s not all mints on your pillow, though. There are advantages and disadvantages to any hotel rewards program, and members always have to act strategically in order to maximize their earnings. 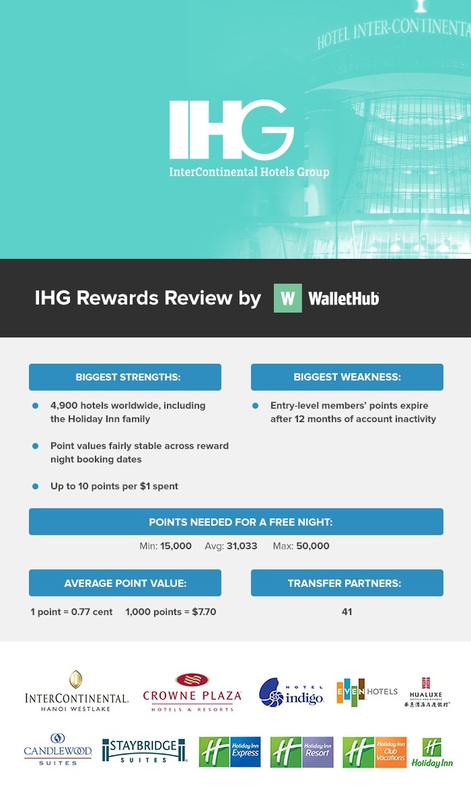 With that in mind, we thoroughly evaluated IHG Rewards Club to determine where it’s most and least hospitable, identify features that users should and should not avail themselves of, and ultimately clarify its position in the hierarchy of hotel rewards. Check out our findings below before your next check-in. This is what we like we most and least about IHG Rewards Club. More information about each of these high-level points can be found in the sections to follow. IHG Rewards Club members earn a certain number of points for each dollar they spend on IHG purchases – from reservations booked directly through one of the chain’s brands to room service to pay-per-view movies. How quickly you accumulate points depends on which IHG-owned hotel you visit. The final member of the IHG family, Kimpton Hotels & Restaurants, does not participate in the IHG Rewards Club due to its preexisting loyalty program, Kimpton Karma Rewards. As a result, you will neither earn IHG points when staying at a Kimpton property nor will you be able to redeem IHG points for free Kimpton nights. You still have other options when it comes to obtaining IHG points, though. You can purchase points in increments of 1,000 if you need more than you’ve earned to redeem for a given reward. This is a bad deal, though, because you will have to spend more per point than each point is ultimately worth regardless of which redemption option you choose. What’s more, purchased points won’t help you qualify for Elite status. Only points earned for booking a room or making purchases at IHG-family hotels (e.g. buying a drink at the bar) count toward free nights. IHG regularly posts offers whereby customers can earn bonus points or free nights by completing certain activities. For example, its current “Accelerate Rewards” offer enables you to earn up to two free nights by paying for up to four nights within 100 days. It’s a good idea to keep an eye on these deals, but just because they are “featured” doesn’t mean they’re good. Although basic membership in IHG Rewards is free for anyone who signs up, there are also elevated status levels that provide greater benefits but come at a cost. Here’s the breakdown of what you’ll get and how to qualify. Note: Costs are based on IHG’s $116 average daily room rate as of February 2015, the most recent data available. In addition to its four core status levels, members may also have the opportunity to obtain an add-on designation that facilitates the earning of even more benefits. Most people will be better off redeeming their points for free nights, but heavy travelers may be able to get their money’s worth. *Except at The Venetian and The Palazzo, where you get a $100 credit; includes alcohol. The IHG® Rewards Club Traveler Credit Card is a solid option for people who don’t plan to charge a whole lot to their hotel credit card, thanks to its relatively low annual fee. But the IHG® Rewards Club Premier Credit Card should be the top choice for frequent travelers who are ready to commit to IHG for hotel stays. The bigger bonus it provides will alone cover the added cost of its higher annual fee for two years. You’ll also earn twice as much on IHG stays. How Much Are IHG Points Worth? IHG points fluctuate in value based on a number of factors, most notably, redemption method. Reward nights tend to be the best deal, with each point worth a bit more than three-quarters of one cent ($0.0077) on average. However, as you’ll see below, even this depends on your destination, travel dates and hotel of choice. *In certain cities, additional locations exist that do not currently allow rewards-night booking. WalletHub compared the cost of booking hotel reservations in 10 popular destinations – five domestic and five international – using IHG points and cash, respectively, for four sets of three-night stays reflecting weekday and weekend stays in each destination’s high and shoulder travel seasons. All IHG hotels within a 10-mile radius of each city’s center were included. Point prices were obtained from IHG’s website, and Kayak.com was used to determine their dollar equivalents. IHG Reward Nights (no blackout dates) $7.70 Free nights are the obvious appeal of joining a hotel rewards program. It’s also the way to get the best value. The one thing you need to watch out for here is that taxes and fees are not covered by points. But that’s the case with all hotel chains. According to IHG, nearly 1.5 million rewards nights have been redeemed by Rewards Club members in the first two quarters of 2015. You need at least 10,000 points to redeem for a free night at an IHG property. Reward nights at all-inclusive resorts within the IHG family require an additional 10,000 points to cover the added benefits that come with a reservation. Other Hotels $3.20 Rewards Club members need not restrict their travel redemption to IHG hotels, as the program enables points to be used for flights, rental cars and even stays at unaffiliated hotels. Airfare and hotel reservations require a minimum of 20,000 points, while you need at least 10,000 to redeem for a rental car. Gift Cards $2.40 IHG’s online rewards mall features gift cards of varying denominations for a total of about 80 retailers. Shopping $2.50 In addition to gift cards, Rewards Club members have the opportunity to redeem points for merchandise in a variety of categories – from jewelry to sports equipment to electronics to kitchenware. Digital Entertainment $2.80 Users can purchase songs, albums, games, movies, TV shows, etc., though IHG’s online rewards mall. Hotel rewards programs always throw a lot at you, and it’s all very impressive in aggregate — free stuff usually is. The key with any loyalty program is to not allow these perks to drive your spending. In other words, get paid for money you would spend anyway; don’t spend more to get more points. Points, as you can see above, just aren’t worth buying. But such is a truism that spans hotel brands. And while IHG fans should certainly make sure to heed it, there are a few other, more specific measures you can take to maximize your Rewards Club compensation. Make Sure To Open The IHG Rewards Credit Card: If you’re truly going to pledge your allegiance to a given hotel chain – often an indication of frequent travel – it usually makes sense to get that chain’s co-branded credit card. Membership has its privileges, after all – typically in the form of complimentary elite status, bonus points on hotel spending and the potential to reap a windfall of free nights.The IHG® Rewards Club Select Credit Card is no exception, offering the average person net earnings of roughly 11 free nights over the course of the first two years’ use and providing complimentary Platinum Elite Rewards Club status. Redeem Only For Free IHG Nights: Free nights are what you’re in it for, right? This advice might be preaching to the choir, but it’s nevertheless important to stress that your points will go a lot further in dollar terms when you use them to book reward nights at the IHG family of hotels instead of any of the other Rewards Club redemption options. It’s not even close.Of course, there is some point-value variation in play with IHG rewards nights, too. Points are worth more when redeemed for weekday nights and shoulder season dates. But the difference isn’t as pronounced as with some hotel programs, so it shouldn’t be something you stress over. More Points Doesn’t Mean More Value: Points aren’t directly correlated to a given IHG hotel’s room rate. In other words, two rooms that require the same number of points to book may carry quite different prices when purchased from a third-party provider, like Kayak.com or Expedia.com. And one room that costs more in terms of points than another may actually be less expensive in dollars.If you want to make sure you’re getting a good deal on a given night, just see how much each of your options would cost if purchased through a travel-comparison website such as Kayak.com or Expedia.com. Don’t Pay For Supplementary Status: Much like buying points tends to be a bad deal, e most of the perks that come with this status anyway, while leisure travelers with the requisite credit standing would be far better served saving their cash to meet the IHG® Rewards Club Select Credit Card’s initial bonus requirement. Point Transfers Don’t Pay Off: While IHG enables you to transfer points into other Rewards Club members’ accounts, you should neither avail yourself of this nor consider it a convenience. Think of it instead as a rip-off because that’s what it is. Points can only be transferred in increments of 1,000, and you’ll be hit with a $5 fee for each of those increments you decide to gift to someone. In other words, if you were to send 50,000 points to a friend or family member, it would cost you $50.Considering that 1,000 points equates to only about $7.70, on average, when put toward a free night, it’s obvious that the $5 transfer fee is prohibitively expensive and would serve to effectively rob your points of most of their value. Scammers. $1,000 in 6 charges on 1 day fraudulently charged to my credit card Jan 2019. Customer care - 5 transfers Asian, poor English. Mention fraud and unauthorised teansaction and all of a sudden, another transfer and lains they can't hear and hang up. Another Asian scam. Don't do it.